With the presence of a large pool of participants, the global coil coatings market is displaying a highly competitive business landscape, finds a new research report by Zion Market Research (ZMR). The Dow Chemical Company, The Beckers Group, The Valspar Corporation, The Sherwin-Williams Company, Akzo Nobel N.V., Kansai Paint Chemical Limited, Henkel AG & Company, DuPont, BASF SE, and Wacker Chemie AG are some of the key vendors of coil coatings across the world. These players are focusing aggressively on innovation, as well as on including advanced technologies in their existing products. Over the coming years, they are also expected to take up partnerships and mergers and acquisitions as their key strategy for business development, states the coil coatings market study. Citing an instance, in October 2018, the Chinese division of Nippon Paint and Future Building Development Forum in Qindao announced the setting up of Nippon Paint-Wiskind joint innovation center in coal coatings sector. Reportedly, in the new joint innovation unit, Nippon Paint and Wiskind- a domestic construction market leader in manufacturing and pre-coated metal trading and pre-coated metal application products- are going to co-ordinate closely along a full innovation process. As estimated in this report, the global coil coatings market stood at US$ 5.63 billion in 2017. 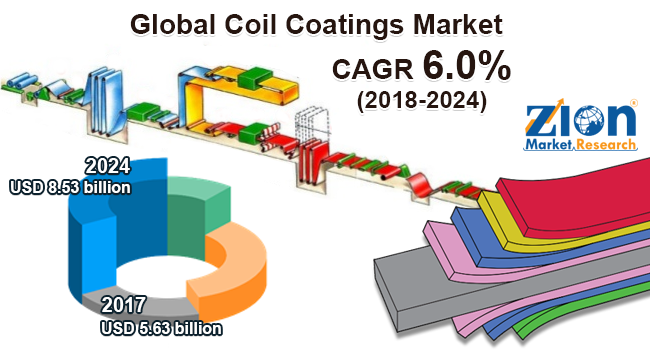 Witnessing a tremendous rise during the period from 2018 to 2024, the revenue in this coil coatings market is expected to reach US$ 8.53 billion by the end of the forecast period. The main types available in this coil coatings market are Silicone-Modified Polyester, Polyester, Polyurethane (PU), Polyvinylidene Fluoride (PVDF), Epoxides, Plastisol, and Acrylics. “Global coil coatings market growth is predicted to gain traction over the coming years, owing to the thriving construction activities across the globe along with rising demand for weather and corrosion resistant coil coated products,” says the author of this coil coatings market study. Apart from this, massive product application across automotive, packaging, furniture, and HVAC will further contribute towards coil coatings market revenue. Fluctuating raw material costs used to produce coil coatings, however, may restrain the growth of coil coatings market in the forecast period. In addition, the automotive industry is replacing metals with engineering plastics, which may impact the growth global coil coatings market in the near future. Regionally, Asia Pacific has been leading the worldwide coil coatings market and is anticipated to continue on the dominant position in the years to come, states the coil coatings market study. Constant economic growth in countries such as India, China, Malaysia, Thailand, Singapore, and Indonesia along with demand for construction activities are the key factors behind the dominance of the Asia Pacific coil coatings market. Humungous demand for commercial and residential construction activities is another significant factor that will support the growth of this regional coil coatings market.